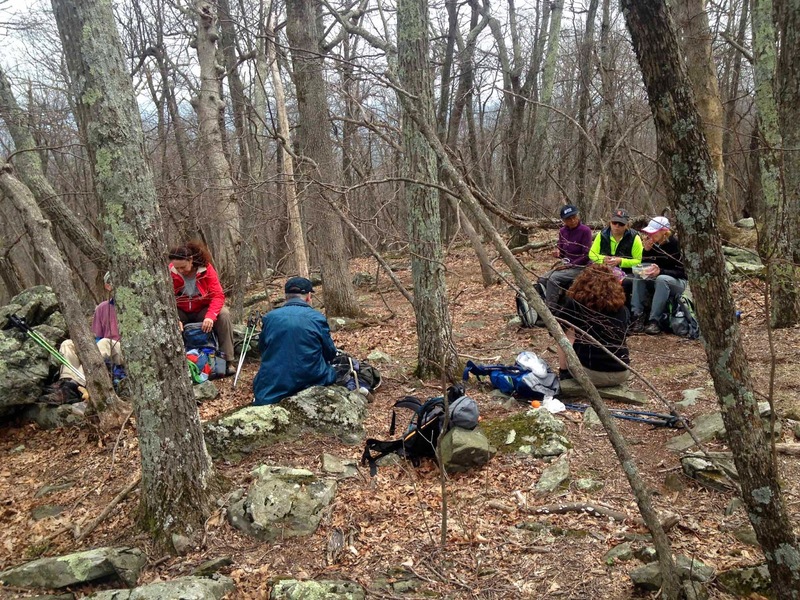 We had an amazing hike of the AT from Dripping Rocks Spring to Humpback Rocks. The weather couldn’t have been better and the flowers were starting to bloom. 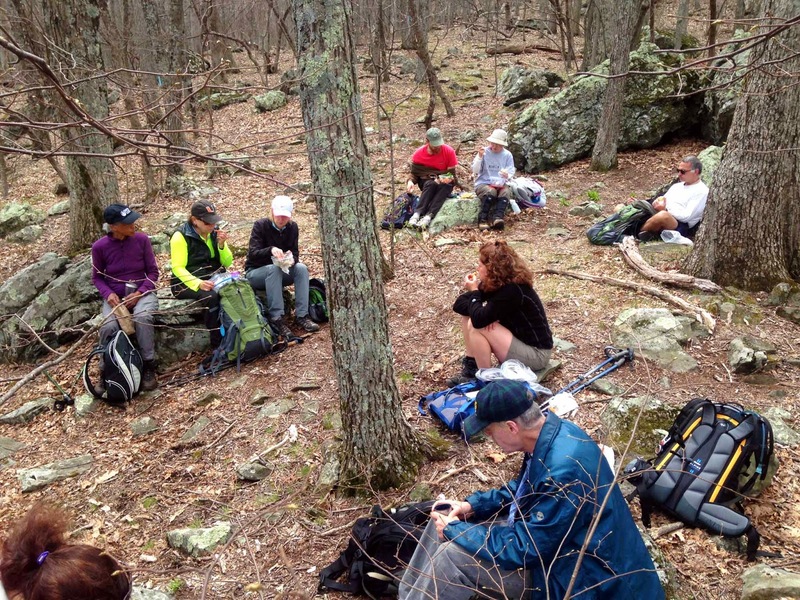 19 folks enjoyed a perfect hike on a perfect day. 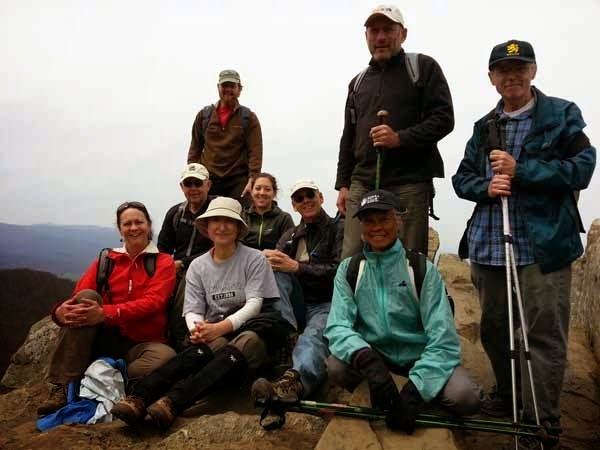 Those joining us were Dan Ralston and Kelly O’Rourke (hike leaders), Jeanne Densmore, Sunny Choi, Virginia Masterson, Sonia Bendjemil, Emil Frlez, CJ Woodburn, Brian Muszynski, Emerald Young, Leon Gorman, John Sinclair, Iva Gillet, Bill Holman, Michael Seth, David Crowe, Ginny Barber, John Brandt and Lindsay Brown. 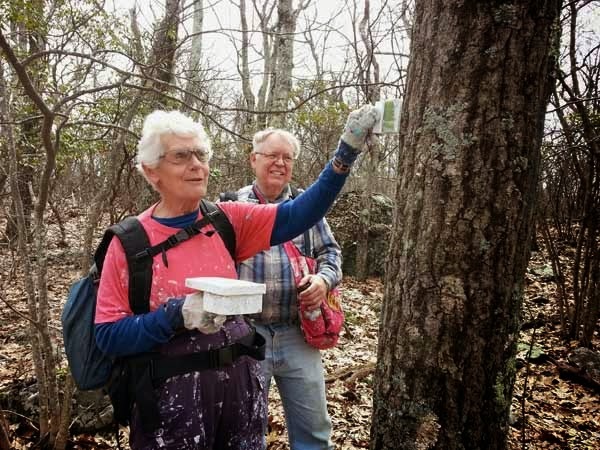 After passing the springs and climbing on the rocks on Humpback Mountain, some folks stopped at the Humpback cliffs for a snack and view of the melting snow at Wintergreen. It was here that John Brandt materialized. We continued onward to Humpback Rock. Along the hike we met a very colorful pair of AT overseers. They were Fran Leckie and Steve Yarus from the Old Dominion ATC. 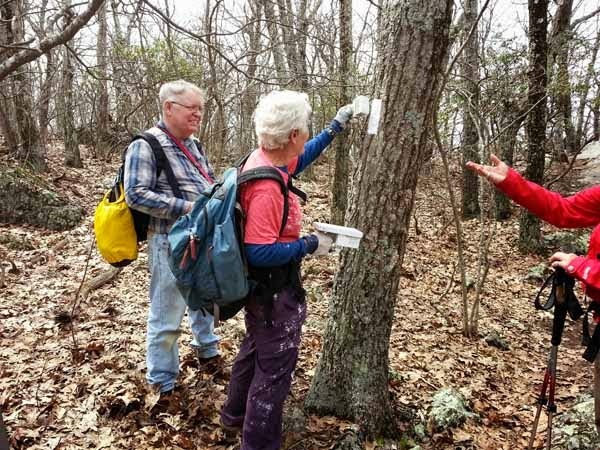 Their group maintains the AT from Reed’s Gap to Rockfish Gap the 3rd Saturday of every month, traveling from Richmond. According to Fran the 'Naughty Girl Creek' was named after her. They were re-blazing the AT and we stopped and thanked them for their dedicated work. Lunch was around Humpback Rock, with some eating on the Rock and others in a less congested area nearby. Most of the group continued on to the parking area, where we had a Don Davis sighting, as he was ascending with friends. Kelly added on another 3 mile section of the AT for a total of about 10.5 miles for 6 long distance hiking folks. To make a perfect day even better, most of us convened at David Crowe’s beautiful new home for after hike refreshments with a stunning view of the Valley.